A bank is a financial institution which is involved in borrowing and lending money. Banks take customer deposits in return for paying customers an annual interest payment. The bank then uses the majority of these deposits to lend to other customers for a variety of loans. The difference between the two interest rates is effectively the profit margin for banks. Banks play an important role in the economy for offering a service for people wishing to save. Banks also play an important role in offering finance to businesses who wish to invest and expand. These loans and business investment are important for enabling economic growth. Offer customers interest on deposits, helping to protect against money losing value against inflation. Lending money to firms, customers and homebuyers. Banks are seen as a secure place to deposit money. It would be impractical and risky to keep all your savings as cash under your bed. In medieval times, people would often pay early banks (e.g. Knights Templar) to keep their money and assets safe. It also saves people worrying about money. In the UK, commercial banks are guaranteed by the Bank of England as a lender of last resort. Therefore, consumers see them as safe places to deposit money. Commercial banks pay interest on deposits. For current accounts, this may be very low, but for saving accounts, the interest rate can be significant. In a period of inflation, interest rates on deposits are very important for maintaining the real value of your savings. For example, if inflation is 4% then keeping cash will see the value of savings decrease in value. However, if the bank is paying an interest rate of 6%, then the real value of your savings will increase. For some customers, such as pensioners, interest payments on their bank savings can be an important source of income. Current account (checking account in the US) This bank account enables easy and quick access to money. A customer can withdraw the money at a moment’s notice and will have features, such as debit card and cash points. The interest rate on current account tends to be very low because the bank needs to keep sufficient liquidity to meet the demand of customers to withdraw. Savings account (time deposit account) Savings accounts typically have limits on the amount of money that can be withdrawn at once. Often banks require a certain notice of (e.g. seven days) to pay money requested. This enables banks to pay a higher interest rate as the bank needs less liquidity. A bank can become more profitable by using a percentage of its deposits to lend to other customers. If a bank pays 2% on bank deposits but lends money to firms and consumers at 6%, then it can make a bigger profit on its deposits. A bank just needs to keep sufficient liquidity to meet the demands of customers to withdraw money. Different interest rates on different types of loans. Bank lending varies from unsecured personal loans to secured mortgage lending. Unsecured lending tends to be at a higher interest rate because of the risk factor. 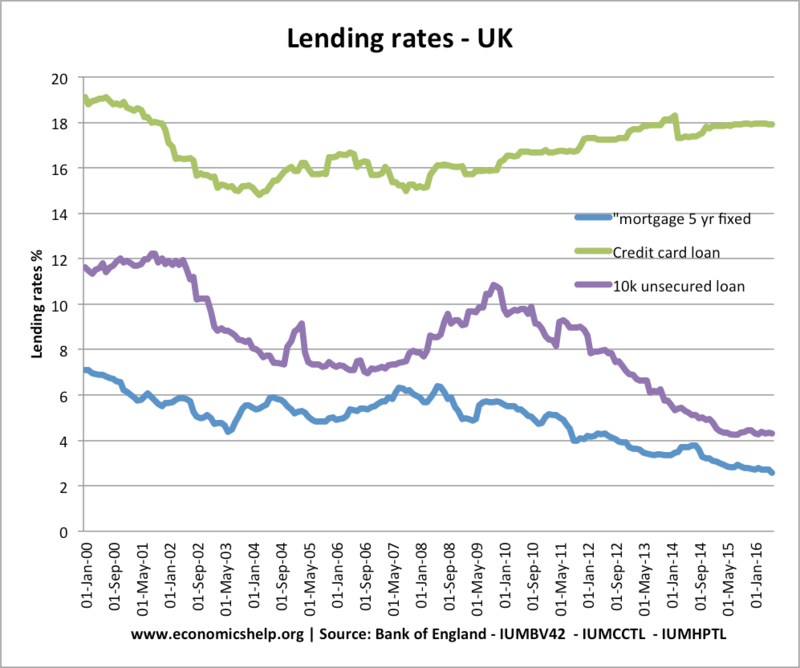 Secured mortgage lending is at a lower rate, but can be over 30 years or more. Personal loan – In this case, the bank may make a loan to be paid back over a few years. This loan may be unsecured against any assets like a house. Personal loans could be for a big purchase like a car or specifically to help fund a career or educational improvement. Business loan – A loan for a firm to invest and expand their business. Mortgage – This is a special type of loan, where the bank advances a loan to purchase a house. Usually, the customer will need to pay a deposit on the house, e.g. 10% of the loan. The bank legally owns the house until the borrowers have finished paying back the mortgage payments over a period of 20-40 years. Interest rates on mortgages tend to be relatively low because the loan is secured against the value of the house. However, on a 30-year mortgages, home-buyers will typically pay more interest than the total cost of the house. Overdraft. A bank can agree on an overdraft with customers. This allows them to borrow money in the short term quickly and conveniently. However, the amount allowed tends to be quite small. Banking in the UK is a very profitable enterprise because there is a lack of competition. The market is dominated by the top 10 banks and in particular the big 5 banks. Loans essentials to enable firms to invest and expand. However, banks are not the only source of finance. Firms may turn to private investors, stockmarket, government grants or personal savings. In times of recession or shortage of funds, banks may not be willing to lend when firms need it most. Bank lending is profitable for banks and can incur significant costs for the firm. Consumers increasingly need banks to pay for bills electronically. Bank loans and mortgages provide an opportunity to purchase very expensive items and pay back over a long period – e.g. house, car. 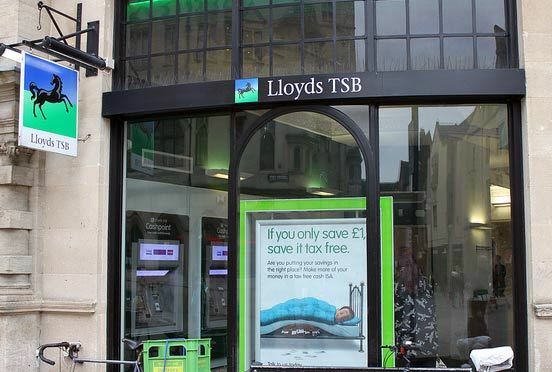 The poorest consumers often don’t have access to bank account and bank loans, causing the poorest to look outside traditional banking to more exploitative loans, such as payday loans and money sharks. Some insurance services are not necessary, for example, insuring electronic goods is expensive compared to the cost of replacing them. Low-income consumers may feel they cannot afford insurance payments and put themselves at risk.